CBS has announced a new Star Trek series for January 2017. I'm excited! I was extremely disappointed to find Brian's Twitter empty of thoughts on the subject. He wouldn't be my first choice, that would be Ron Moore but his TV record is much better than his movies. Over in TV groups they're commenting it's independent of the movies. Not sure how they're going to do it. Someone brought up the fact that two producers had a sort of first right of refusal on any TV Trek, and they canceled Enterprise and kept Trek off the air until Paramount could fire them. Apparently they're gone now. A plucky girl from a planet that is oddly similar to 21st century Earth is offered the opportunity to travel aboard a starship that drops her off at home again from week to week, and she has trouble balancing school and intergalactic adventure. A bounty hunter hitches rides on starships in search of an escaped convict shape-shifter... and finds love and laughter all along the way. A ragtag crew of a small freighter has to steer clear of Federation starships while conducting a business of semi-legal trade and salvage. The return of Gary Seven, star adventurer. An all-girl band travels the galaxy performing for Starfleet audiences and any other gig that pays the bills. I actually tried to think of good ideas and couldn't. Gary Seven is a Time Lord...just think about it. Oh man. I'm part of a Trek board and the fan reaction has been...bipolar, to say the least. There has been a lot of complaints about it being exclusively available through CBS All Access Streaming, but the fee is 6 bucks a month, so I don't really see the problem. Kurtzman's involvement is, of course, polarizing. Given is long running history with CBS and TV producer he might have the right set of skills to manage this new show. I think that CBS will be very involved to get the results they want. The press release states that it is not connected to the new film, but does not detail what timeline or continuity it will be in. Negotiating with Paramount? You say that, but in one of the extras on the Enterprise DVDs, Brannon Braga says that one studio exec was really pushing for the ship to have another "Ten-Forward"-type area, and each week they'd feature some new band that Paramount/Viacom/Whoever needed to pimp. I had a lot more sympathy for Berman & Braga after watching those making-ofs (in the sense that it was greater than zero). He obviously died from excitement. Honestly, I would be interested in listening to some of their making of commentaries just because there is so much that goes on behind the scenes that audiences are (generally speaking) unaware of. And then there's the guys like me, that will probably appreciate a fast-paced Trek. Try to ignore the freak-of-the-week type of show, with 20+ episodes each season, and you probably win me over. Then again, I was never much of a Trekkie to begin with. The script was co-written by Simon Pegg, so I guess there's some cause for optimism. The first thing I thought was "God, I feel bad for Brian." Seriously, this looks like hot trash. Granted, trailers can be all kinds of misleading, but all the PR they've done for this movie has been saying they're going for a more cerebral tone, and *this* is the first thing they give us? Don't get me wrong, I don't at all like TNG, and I love the funny adventurous feel of TOS. But there was always a balance between fun and thought there, and that balance is nowhere to be seen here. This was their first chance to prove to us that this movie was gonna be what was promised, and they blew it. And that's not even touching the problem of yet another cheap callback to earlier films. Also, the fact that Pegg's initial script was rejected for being "too Star Trek" has me all sorts of concerned. I'll still go see it, of course, and I'll try my hardest to reserve judgment as this is only the first teaser. But god, this makes me sad. What a wonderful world we live in when the new Independence Day movie looks better than the new Star Trek. It's like the 90's all over again. Does anybody else hear the phrase "Star Trek Beyond" and immediately expect a ska instrumental to start up? "Don't watch that, watch this!" indeed. Justin Lin made some comments that the film is designed to be a conflict of philosophies between Starfleet and the villains. Lin is aiming to provide a bit more of a challenge, as well as a looking forward, rather than back at the prior films. Worth a watch, skip to the bit he talks about the trailer. Pegg's and Lin's comments have been interesting. 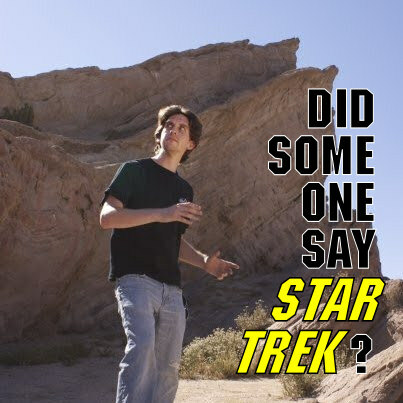 It has given rise to a lot of talk on Trekbbs that they don't like the trailer and are engaged in damage control. I always thought trailers were now studio mandated cuts to show certain features, with little to no concern about the final product. I really haven't been following this, but I remember hearing about the Indiegogo campaign. All seems a bit of a shame as it sounded like it was being done people who actually 'get' what Star Trek is, as seemingly distinct from people in charge of things lately. Welp, that calms my concerns about Kurtzman.